I'm really close to Joel and his siblings, so it was really fun to spend the afternoon with them and my sister. It's nice having people who are your cousins and your friends….you automatically love each other because of the whole family thing, but it's even better when you can have fun together and tell each other things that you can't tell anyone else. :) Somehow, cousins always seem to have your back and are always on your side…I love that about mine. The shower started a few minutes before we arrived, and my mom told me that Charlie had volunteered to say the blessing on the food. I was so proud of my sweet, big boy and that heart of gold he has. I needed an outfit that would take me from the beach, to a car drive (I hate being uncomfortable in the car), to a bridal shower, and then on to an evening of playing with babies and family. This outfit seemed to do the trick. PS. Make sure you enter to win this Old Navy gift card giveaway! That is a very multi-purpose, practical outfit! And I love the bright colors! Comfort is always my primary goal when picking out clothes for a car trip, too! I love your red pants! That's awesome that the outfit took you through all that. Gotta love a multi-purpose outfit! 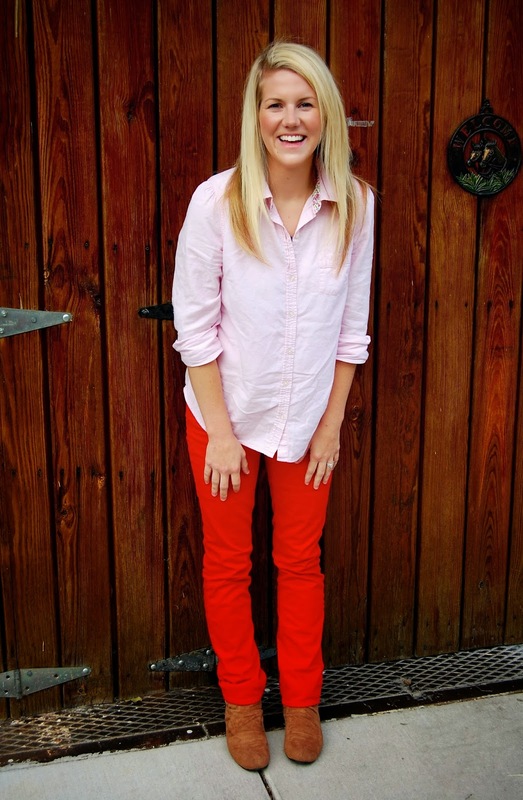 These red pants are so cheerful! 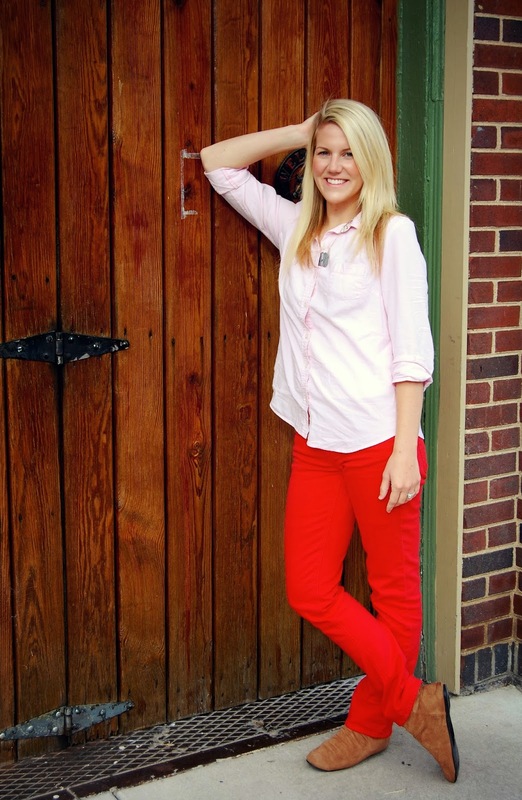 Love how you posed next to the red wall to match, hehe. Comfort is a must for me too for long car rides. Adorable outfit! I love any outfit that includes wearing an oxford! Stopping by from Random Wednesday! I love that your shirt can be found at Old Navy because I want it so badly! Baby pink and red...I never would have thought of that - genius!! this is the perfect outfit for a long day! comfy and super cute! I love that you said "I like eating a little bit of a lot of things" -- that is SO me. Those red pants are killer! So sweet of Mr. Charlie to volunteer to bless the food, love his little heart!! I love the pink shirt with the red pants! I've been searching for a pair of red skinny jeans for a while now-I love how they add such a nice bright pop of color especially in winter. Charlie is the absolute sweetest - good job to you on raising him right! :) Also I think it's so funny that it looks like you're floating in the last photo - you look so cute! Adorable! Love the pink and red together. And if it was comfortable enough to for a car ride but also works for a shower, it is definitely a winner! I am loving the red/pink combo on you! Cousins are the best!! I'm loving the pink and red together! I love how you mixed red and pink! So many people are afraid to do that but you show that it can work beautifully! You're right - this outfit is perfect! You look great girl! that does look comfortable! i love the red and pink together ;) I can't stand being uncomfortable while traveling either... eh! I'm traveling tomorrow from Japan to Hong Kong and totally wearing my Madewell coral jeans. You've inspired me. 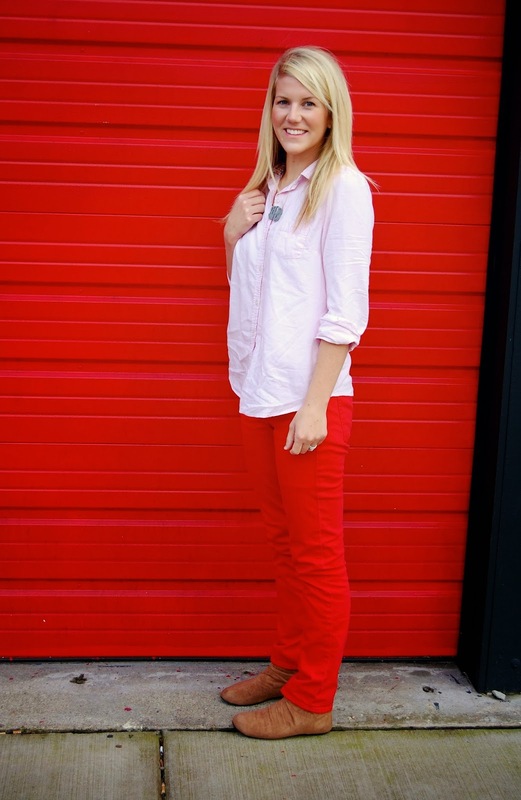 Love bright reds like this one! Stopping by from the Random Wednesday and new to your lovely blog :) Oh and I hate being in uncomfy clothes in the car as well! you look gorgeous! :):) love this outfit! You are so right…it is great to have cousins who are also your friends! Sounds like you all had a blast! Love the outfit! And that last pic is great, it's like you're in front of a green screen! Except red of course. Disappearing legs! how fun!! def the perfect outfit! Love the bright outfit! I hate that everyone thinks you must dress as dreary as the weather is throughout winter. You look great! !